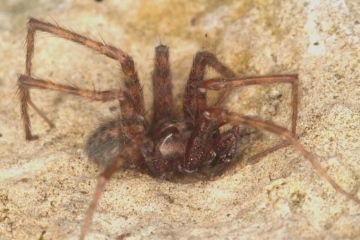 Tegenaria domestica is widely distributed in much of Britain, but more scattered in the west and north. It is widely distributed in Europe (Maurer 1992) and has colonised many other parts of the world as a result of transportation by humans. Found most commonly within buildings and adjacent gardens. Bristowe (1958) reported finding the species in the entrance to dry caves and in hollow trees. Adults of both sexes have been recorded throughout the year, but mostly from spring to mid-summer and autumn. Common, but in some places, such as Cambridgeshire and Essex, it seems much less common than T. gigantea (I. Dawson & P.R. Harvey, pers. comms.). It may be suffering as a result of competition from the larger Tegenaria species, and also from expanding populations of Pholcus phalangioides and Steatoda nobilis, both of which eat other spiders. Account last edited by Geoff Oxford at 16:03 on Fri 22nd Jun 2018.